Okay, I admit it. When we lived inland, I hated vinyl siding. I thought it was tacky. But after 10 years of living along the coast, I've changed my tune. It's starting to seem pretty fabulous to me! You see, salt water wreaks havoc on wood. It's a maintenance nightmare. And while I like the look of real wood, it's a lot of work every few years: scrape, sand, paint, repeat. It's a lot of work, and there are much better things to do with your time! I know there are options out there. 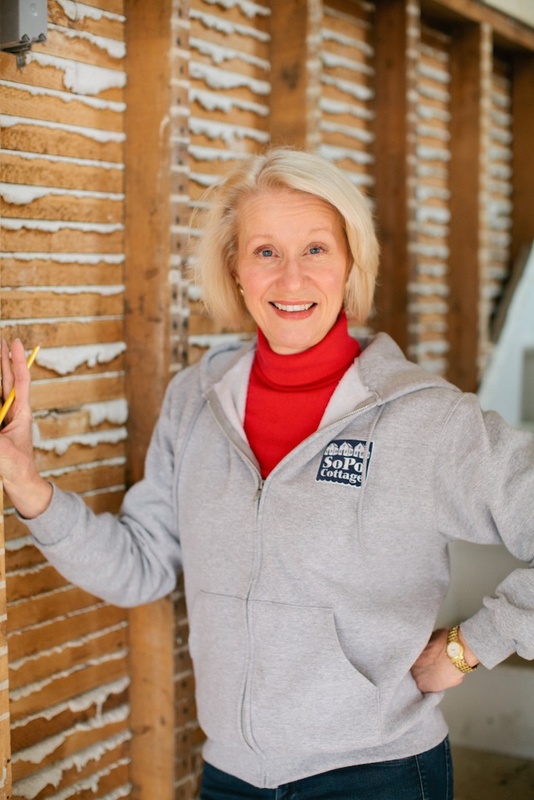 On our own house, we used something called cementitious siding (weird word, I know). It's essentially siding that has a cement core (and it weighs a ton!). Supposedly, it doesn't need paint for 15 years, but we've heard from other people that they had to paint their house in half that time. 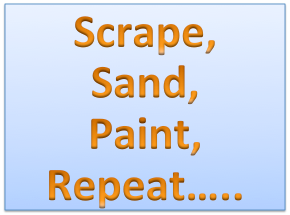 And once you start painting it, the whole scrape, sand, paint, repeat cycle starts all over again. 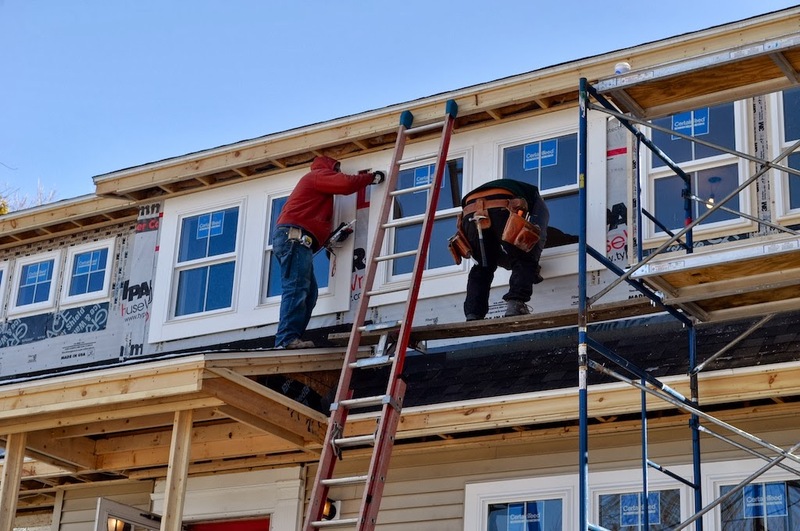 And interestingly, the National Association of Realtors just published a survey on the Best and Worst Home Remodeling Projects and vinyl siding was near the top of the list. Why? Low maintenance is something that everyone wants! So, when it came time to look at siding for the Beach Cottage, we decided to use vinyl siding (which is on the bottom half of the house already). We have no idea when the original siding was put on the house, but it's in such nice shape, we think it's pretty recent. Since it would be impossible to match the color exactly, we're going with a slightly different product on the upper half of the house. Cedar Impressions is a newer product that looks remarkably like cedar shakes, but is actually vinyl. It's roughly 2.5X the cost of plain old vinyl, but we think it's worth it. We had a neighbor stop by while walking her dog this week and she kept asking about the cedar shingles and wouldn't believe they were vinyl until one of the guys from Exterior Alterations showed her a panel! But before the siding could go on, the guys had to finish the window trim. We were all really impressed with how nice the wide, white moldings looked around the windows. See the difference here between the large windows on the left, vs the untrimmed one on the right? They really make it pop! 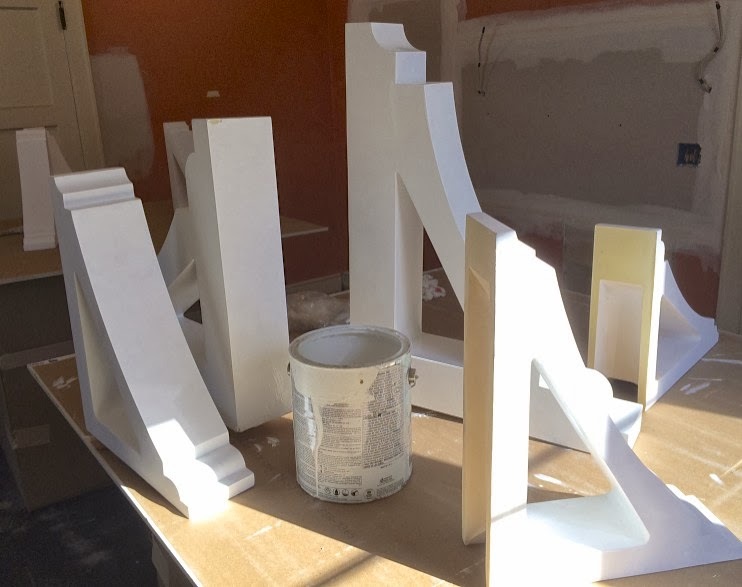 We already think it looks pretty great, but they'll be dressed up even more once we install the brackets. 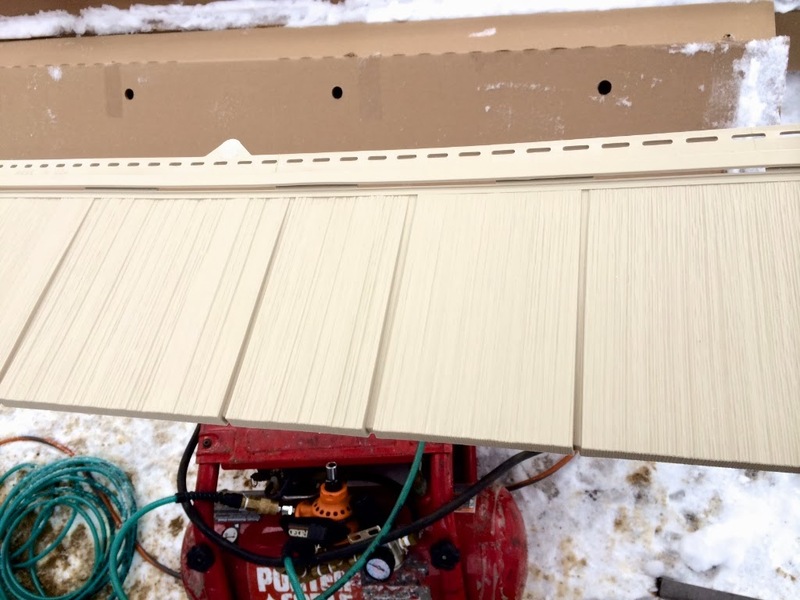 Thanks to Mother Nature, the siding project is going a bit slowly (too cold and it snaps….and if it's not cold, it seems to be snowing! What a winter!). But you can already see how nice it's starting to look! What do you think? Tacky or low maintenance?? I think it's great! First, it will be a great selling feature in your climate! When something is constantly being pelted with snow, salt air/water, ice you need a sturdy barrier. And the cedar shingle look is a great addition! I love the look! Thanks Tara. We're already thrilled with it…..can't wait to see it all up! We had Maibec natural cedar shakes put on our house but we're a few blocks from the water and we're not painting them so we should be OK. I'm not a fan of vinyl siding but I have to admit it looks great on your house. I think it was the right idea. Thanks! I've heard that Maibec shakes are great! I think the siding combination looks great! We have had vinyl siding like your bottom half for thirteen years and it still looks brand new. Love your house flips! Thanks so much Pat. And 13 years that still looks brand new, that's impressive! I think with larger trim the vinyl looks nice. That's what we did for our house too. What kind of trim did you use, PVC? Thanks Brian! And yes, we used PVC for the trim, in keeping with the low maintenance theme! I live in the Pacific Northwest and I haven't seen vinyl siding anywhere in my area I think it might have something to do with HOA covenants...I don't know why, maybe they're siding snobs too ; ) I think your choice is beautiful, and if low maintenance is a happy by-product then I say yippee! I love your taste! ~K. The ONLY choice for a New England home!!! Thanks so much for continuing to follow the blog! Aren't those composite front doors beautiful? I keep wondering if we lived out west, if a real wood front door would hold up. Because where we live, you would constantly be refinishing it! 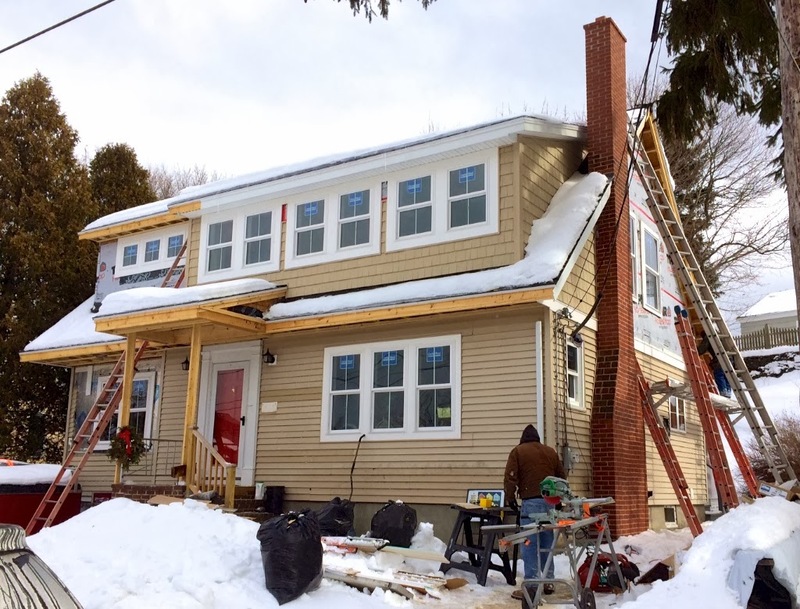 Upgrading to a much better siding such as vinyl would be a smart decision. Though I have seen buildings pull off a aluminum siding quite well though and it looks pretty good. I'll have to see, I currently have just the vinyl and it has been great for me.